Outfit your entryway or indoor living space with the elegant Pre-Lit Merry & Bright Christmas Hanging Basket. This regal, robust Hanging Basket features a perfectly arranged assortment of red, green, and gold ornaments, pine cones, and faux red berries mixed in with bright and lively greenery. Warm white LED mini-lights add dimension and cast a warm glow. Offering up to 180 hours of bright and luminous battery life with the timer (6 hrs. on/18 hrs. off). 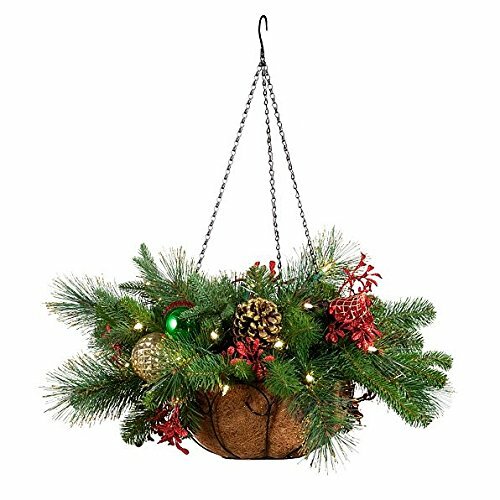 This lovely hanging basket features realistic greenery tips with assorted ornaments and red berries for a festive touch.